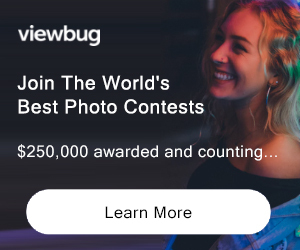 Are you fed up wasting time trying to find photo competitions only to learn that you are not eligible because of age, nationality or experience? PCN has developed a new and exciting tool aptly named Photo Contest Finder which is free to use, just like all other PCN services. Photo Contest Finder will save you time and make your life much easier. Say goodbye forever to scrolling through hundreds of contests on search engines to find those that are open to entry and for which you are eligible. Join us today and Click Here to Start using the Photo Contest Finder. JOIN OVER 99,965 and receive weekly updates!